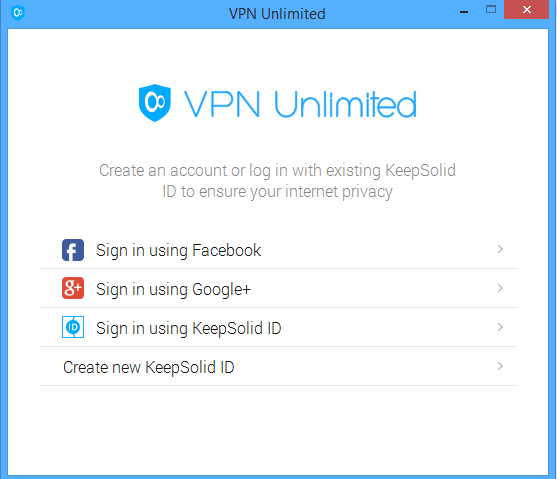 In this review, we check out VPN Unlimited by KeepSolid Inc. This New York-based VPN claims to give users absolute privacy and uncompromising speeds. Let’s find out if VPN Unlimited is really worth your time and money. Pricing & Plans: They even have a lifetime package. VPN Unlimited’s pricing is quite fair when compared to other VPNs. Their monthly plan costs $9.99 a month. With the number of VPNs we’ve tested out, we can definitely say that there are other VPNs that offer more bang for your buck per month. They have a plan at $18.99 that lasts up to three months – roughly a 33% discount. For something a bit longer, their one year plan comes in at $59.99, or around $5 per month. Plus you get 3 months free! Their best value plan goes as low as $2.78 or a total bill of $99.99 that lasts up to three years if you’re looking to commit long-term. 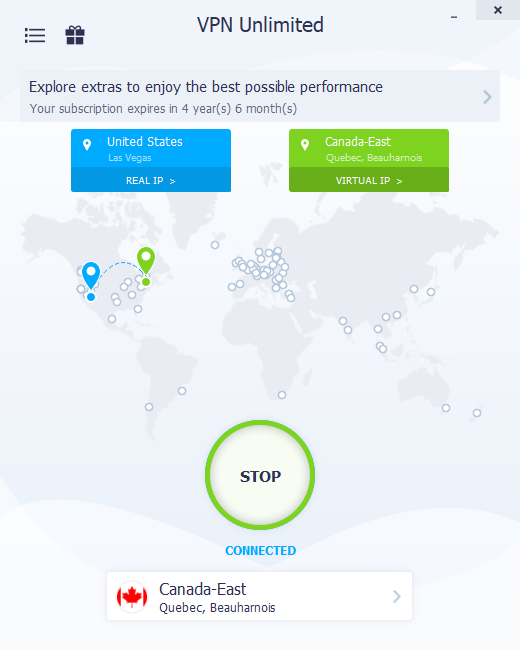 Now, for those who are pretty decisive and are 100% certain they want to go with VPN Unlimited, they offer a lifetime plan which costs $199.99. 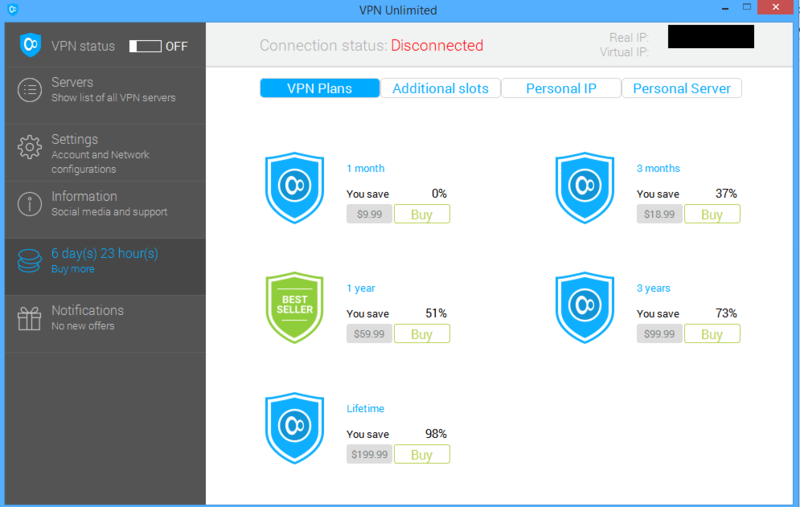 Not a lot of VPN services offer a lifetime subscription package, so VPN Unlimited’s pricing model definitely stands out. And apparently it’s a limited time offer, so we’re not entirely sure when they’ll stop running this promotion. All of their plans include unlimited traffic and connection, military-grade encryption, full access to all their servers, 24/7 customer support, and connection to 5 devices simultaneously. Of course, you can click on the little button towards the top if you want to sign up with 10 simultaneous device connections. If you want to test out first to see if their features are as good as advertised, VPN Unlimited offers a 7-day free trial. Device Compatibility: All of the devices, all of them! Those who want to use a VPN with different devices will have no trouble with VPN Unlimited, as they accommodate a wide array of platforms. They support MacOS, Windows, Linux, iOS, Android, Windows Phone, Apple TV, and Browser extensions for Chrome and Firefox. As we’ve previously mentioned, VPN Unlimited let you connect up to 5-10 devices, but if you want to connect more, they’ll let you add more devices for $0.99 each. The maximum limit of devices is 15. Sign Up Process: Quick and easy! Compared to their speed, signing up for VPN Unlimited is pretty fast and only takes a few minutes of your time. To sign up for the free trial, first download their application. Run and install the software on your device, and launch the app. You’ll see there that you can sign in using your Google account, Facebook, or an existing KeepSolid ID. Since you’re a new user, click on the Create a new KeepSolid ID tab at the bottom of the application. All you have to do is input your (spoof) email address, and you’re done! You can now use their service for seven days for free. If you wish to use their service further, you can upgrade and buy a subscription from the application directly. On the left side of the screen, you’ll see a “Buy More” tab with a countdown of your remaining days for the free trial. That’s great design! Simply click on that and it’ll show you the list of plans they have. You can also buy additional slots to connect your VPN to more devices. Product Interface: Easy to use! When you’ve created your account and logged in, the screen will show neat label descriptions on what’s what going on inside the application. After reading it, you can click anywhere to make the labels disappear. Their product’s interface is user-friendly and pretty easy to use, so no one should have a problem getting around. To connect, just head to the servers tab. Note you can also change the protocol you’re using or change your password in the Settings tab. Having a simple list of protocols to choose from is probably for the best. Customer Support: As helpful as can be! VPN Unlimited offers great live chat support with response times as quick as one or two minutes. The responses from their chat team are straightforward and clear; no generic responses or links to help articles. Live chat agents don’t seem to be online 24/7, though. Aside from this, you can also email them directly at [email protected] if you don’t have time to hang around. Their average response time for their email support is up to one hour, fast compared to the average response time of 24 hours for most VPNs. If you’re in no mood to talk and want to get answers fast, you can utilize their knowledge base page. Their knowledge base page answers general questions such as what a VPN is, how it works, how to get set up, how many servers they have, do they support torrenting, etc. They also have answers for technical questions, account and payment questions, and troubleshooting tips. In addition to their Knowledge Base page, they also have a Manuals page that serves as a guide to installing and configuring your VPN connection on different devices. Payment Methods: Plenty of variety here. You can pay for your subscription via PayPal, credit card, Amazon or Bitcoin. For phone users, you can also pay using the App Store or Google Play Market. Nice to see plenty of choices! Encryption and Protocols: 256-bit for your safety. VPN Unlimited supports a strong military grade 256-bit encryption – the safest encryption available. Great! Most VPNs and millions of companies worldwide use the same encryption to protect their data from breaches. For protocols, they support the standard OpenVPN, IKEv2, and IPSec – the most commonly used protocols in the industry. On top of this, they’ve also developed technology by the name of KeepSolid Wise. 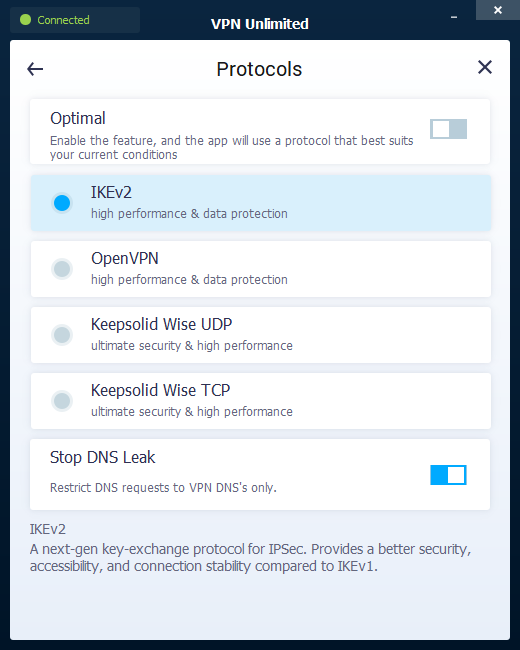 KeepSolid Wise is an extension for OpenVPN that provides users with extended online freedom. According to them, it’s almost impossible to detect or block as it turns your traffic into a normal looking HTTPS! 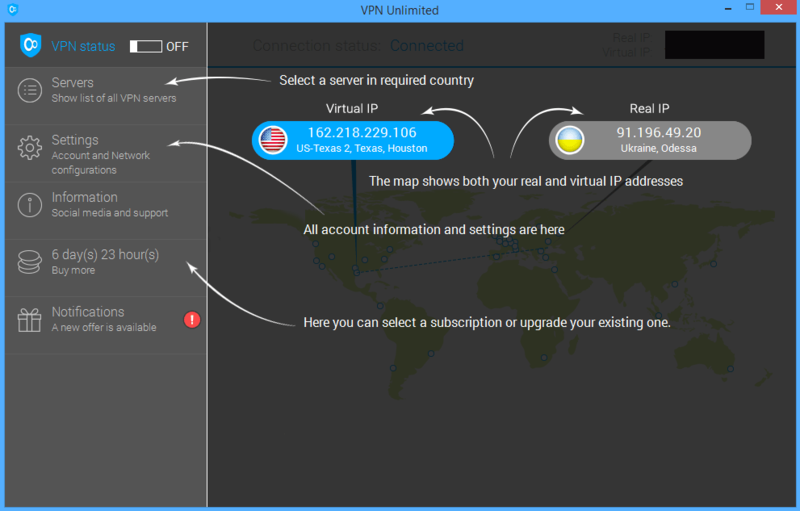 VPN Unlimited is on version 5 of its product already. The new version looks significantly different than the previous version 4 – some things have cleaned up a bit and the client seems to be smaller in dimensions. They’ve opted-in for the generic circular one-click connect button towards the bottom of the screen. Overall, we believe change is good. But it’s also sad to see some of the unique characteristics of VPN Unlimited die out to conformity. Servers and Locations: An okay amount of servers. 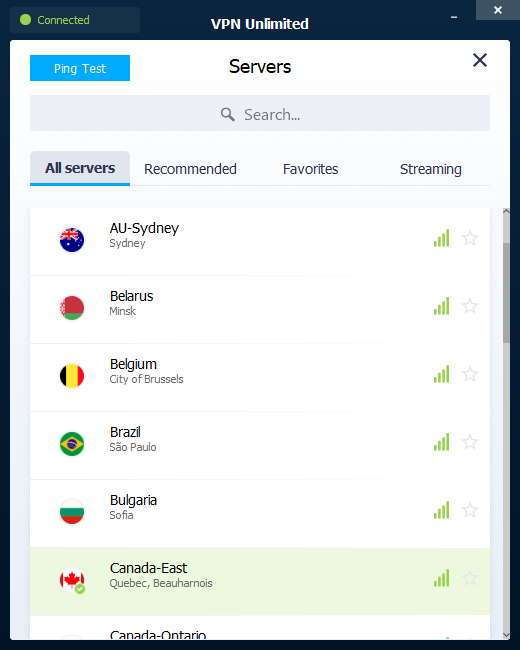 As of now, VPN Unlimited offers over 400 servers in 70 locations around the world. It’s not much compared to the thousands of servers that top VPNs offer, but it’s certainly not bad considering their locations are spread out across countries spanning the globe, which give users good options for places to connect to. 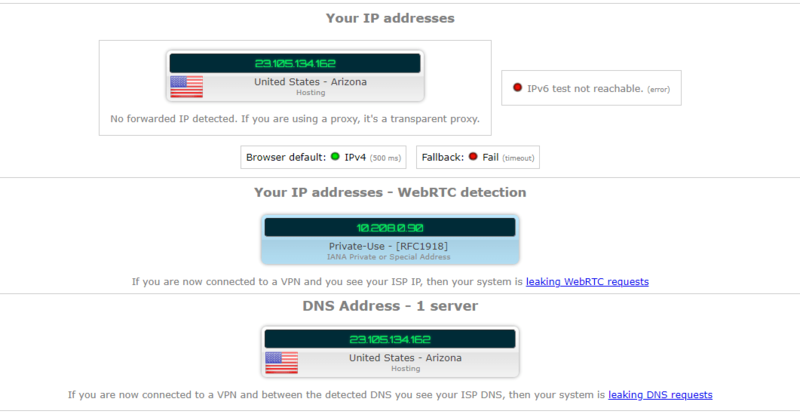 This VPN can definitely help you get around that, given most of their servers are located in Europe. Netflix Test: Works on US Netflix, but nowhere else. In the era of “Netflix and chill”, one of the primary things we look for in a VPN is its ability to unblock geo-restricted content on Netflix. 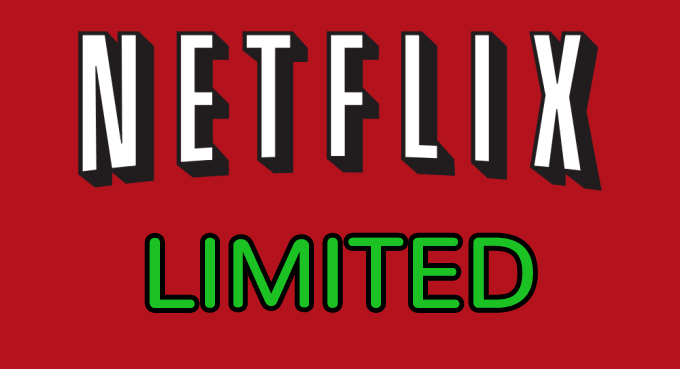 Luckily for users who have their eyes on VPN Unlimited, this VPN gives you access to all the US Netflix content. To get around Netflix, users should use the server named “Streaming Netflix” – the clue is kind of in the name. 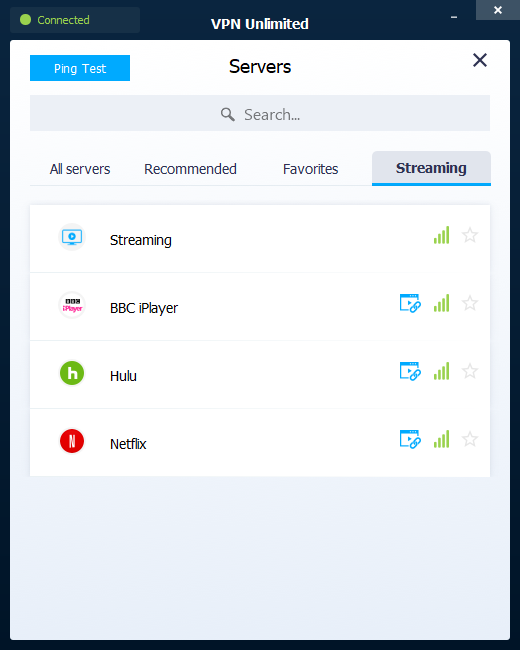 The newer VPN Unlimited app has a tab for all streaming servers. 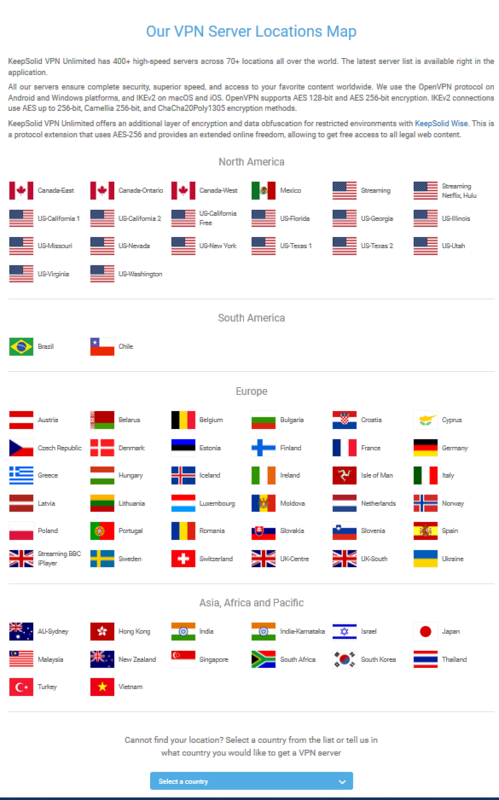 For those who are already in the US, this is obviously not a feature you can utilize, so if you want to access Netflix from other regions, you might want to keep looking for other Netflix-compatible VPNs. Summary? Yes, it can unblock Netflix for everyone but US users. For people who love downloading content online, it’s vital you consider who can see your IP when torrenting (not every peer is a nice person, after all). That’s why people use VPNs to protect their IPs while torrenting, and why we’ve gone to the trouble of compiling a list of the best VPNs for torrenting. Unfortunately, VPN Unlimited does not support P2P downloads on most of their servers. However, there are a handful of servers that could get around torrenting restrictions, like US-California 1, Canada-Ontario, Romania, Luxembourg, or France servers. While it’s not ideal to be limited, at least users have the freedom to torrent. Refund Policy: 7 days isn’t so bad. VPN Unlimited has a 7-day money-back guarantee. As long as you cancel the service and request a refund within the first week of purchasing, you can still claim your money back. Apple In-App Purchases refunds can be claimed from Apple. Google Play Store In-App Purchases refunds can be claimed from Google. Amazon purchases refunds can be claimed from Amazon. PayPal purchases refunds can be claimed in your PayPal web cabinet in the purchase Details. Although it’s nice that they offer a refund, other VPNs offer a longer money-back guarantee which allows users to have more time to decide whether they’re satisfied with the service. On the bright side, there are no catches hidden in their terms and conditions like usage limits to be eligible for a refund. Meaning, you can use their service as much as you want in the first seven days and still be eligible for a refund. Not bad. VPN Speed and Performance: A tad slow! When it comes to speeds, VPN Unlimited is far from being remotely fast! In fact, it’s pretty poor. With the advertised speeds, you can head off, grab a coffee, have a shower, sit down, read a book, and your download will still be not done (okay, we’re exaggerating, but you get the idea). Perhaps it was a hiccup? We will surely revisit and re-do a speed test in the upcoming weeks. Logging Policy: Logging for Marketing? Like most VPNs, VPN Unlimited claims to have a zero logging policy. Although they swear that they don’t store any user activities while using their VPN except for the amount of web traffic for each session and session dates, their next paragraphs seem to contradict this. However, they do swear that the information is collected anonymously so there’s no need to worry. We do believe this is mainly for data analysis and marketing purposes. Since our last review, they’ve updated the product to version 5.0 and now offers a kill switch for the most popular platforms such as Android, iOS, macOS and Windows. Linux users still get no love, though. They do, however, state that a kill switch will soon be available for those users. If you don’t have the time to wait, check out other VPNs. But we do believe their development process is quite efficient so it might be worth waiting. 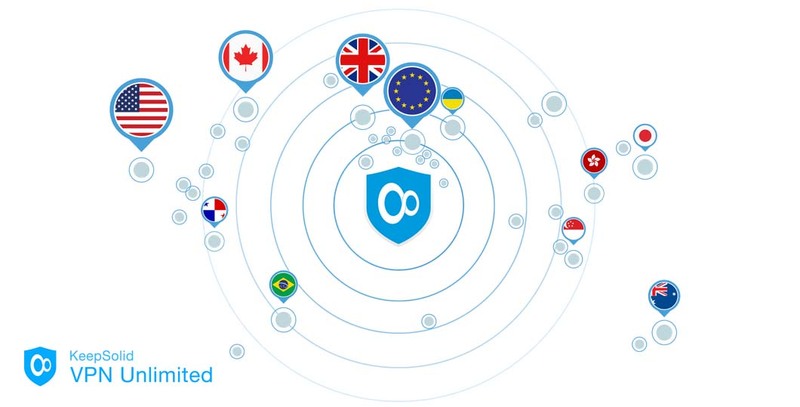 VPN Unlimited was founded back in 2013 by KeepSolid Inc.
Their company is based in New York, USA, which makes them part of the Five Eyes jurisdiction. The Five Eyes is a group of countries that agreed to collect and share intelligence information with each other. This makes VPNs that are in their jurisdiction a risk. For example, the government can easily obtain your info from VPN Unlimited, particularly as they do indeed collect information from you. It’s great that VPN Unlimited has strong encryption and great protocols. Their customer service and product knowledge base pages are helpful, and the fact that they have no leaks is a huge plus. Their product’s interface is easy to navigate around in and provides an overall pleasing experience. When it comes to the important stuff (i.e speed, server choice, privacy), it seems like VPN Unlimited is slightly behind – for instance: the missing kill switch for Linux. 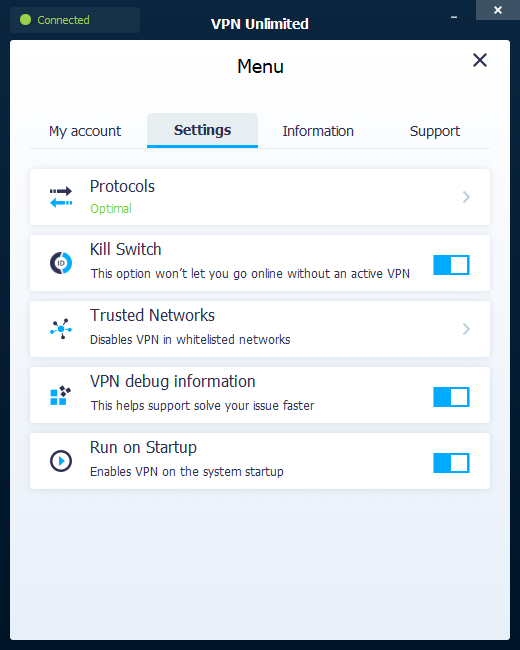 VPN Unlimited deserves some praise, though: we’ve seen them announce news for the development of a kill switch for Windows and actually saw it being implemented within the month (and iOS followed suit). Fundamentally speaking, it is highly unlikely that they will change their logging policy and jurisdiction. So if you’re a privacy freak, you probably don’t need to revisit this VPN review. 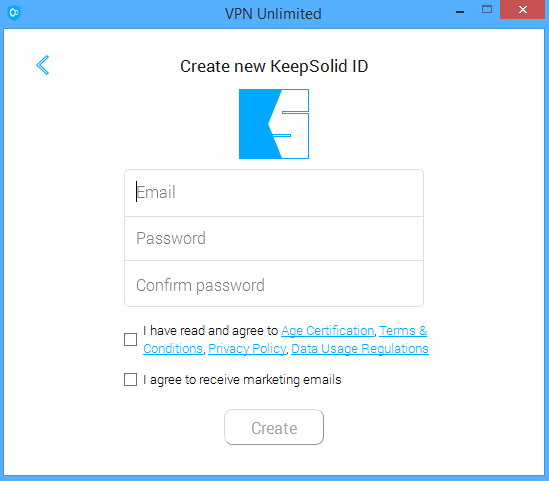 But if you are a fan of solid business practices, pleasant customer experience and a cool looking product, VPN Unlimited by KeepSolid could be a keeper. For privacy advocates like us, we suggest skipping their service and going to our top 10 list.